These unforgettable stories, true and fictional, inspire us all to find our one true love. Tune in to The CW's Beauty and The Beast, Mondays at 9/8c, to watch their romance come alive. Everyone knows the famous story of Shakespeare's star-crossed lovers. Because nothing says "I love you" quite like being miserable and dying together. This classic medieval tale involves the daughter of the King of Ireland, Isolde and Tristan, the nephew of the man she was meant to marry. They of course fell in love, he is banished from the country and dies before they could reunite. Welp, love isn't always uplifting. What could be sweeter than a tramp and a sophisticated lady transcending societal pressures and falling in love over spaghetti? That's amore. The story goes that the Emperor of the Mughal Empire, Shah Jahan, was was bereaved when his beloved Empress Mumtaz Mahal passed away that he commissioned the monumental Taj Mahal as a tomb worthy of her. Talk about a parting gift. If the story of Abélard and Heloise took place in modern times instead of the 12th century, he would be in a world of trouble. 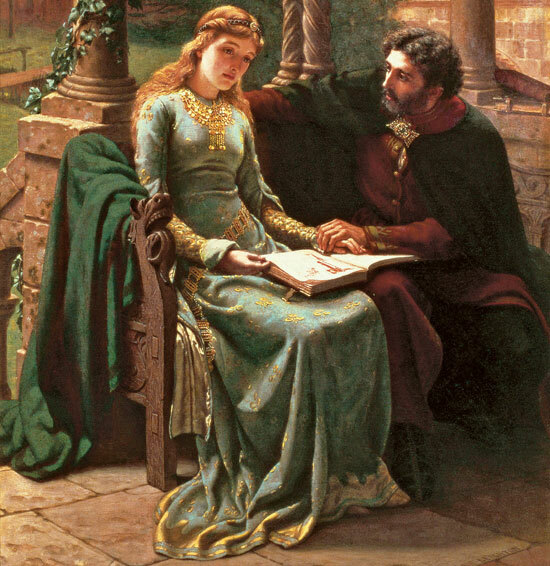 Peter Abelard was a professor and Heloise was his teen aged student. After a love affair that resulted in the birth of a baby boy, they found that they could no longer be together and she became a nun and he, a monk, neither of them ever falling in love or marrying any other person. Aah, young love. Nothing brings two young souls together quite like a good ol' fashion crime spree. At least it was the case for these two who robbed and shot their way through the south before dying violent deaths at the young ages of 23 and 25. The romance between US President John Adams and his wife Abigail was lived out mostly in the pages of their letters in the many periods of time they were kept apart by his travels. Sounds nice, but must've been mighty depressing. If crime sprees or long love letters are not your cup of tea, you could hope to be brought close to your one true love by the enchanting power of science like Marie and Pierre Curie were. Proving that two brains are better than one, they went on to each win Nobel Prizes for their pioneering work. Prince Edward of England quite literally gave everything up for love when he married Wallis Simpson. Because she was American, she could not become a British queen and Edward abdicated the throne soon after becoming King of England so he could spend his life with his dear Wallis. Plus, being King would've been super stressful, right? When an NYPD homicide detective falls in love with a dark, mysterious man, the sparks are bound to fly. Tune in to The CW's Beauty and The Beast, premiering tonight at 9:00 pm ET to watch their romance come alive.